Semi-sweet chocolate describes chocolate which has a level of sweetness that falls between sweet milk chocolate and bitter chocolate liquor (cocoa solids). Most people know semi-sweet chocolate as dark chocolate. Dark chocolate is another name used to describe any sweetened chocolate that does not contain milk solids, for example extra-bittersweet, bittersweet, and semi-sweet chocolate. Generally, European dark chocolate refers to bittersweet, while American dark chocolate refers to semi-sweet. However, the two chocolates are used interchangeably, although the flavour, texture and appearance of the finished product may be changed depending on the type and quality of chocolate used. Semi-sweet and bittersweet chocolates contain cocoa liquor, sugar, cocoa butter, vanilla, and sometimes soy lecithin (which acts as an emulsifier). The quality and blends of cocoa beans, amount and quality of the added ingredients, and the processing determines the quality of the chocolate. Each brand has its own special formula and method of processing. Bittersweet and semi-sweet chocolates contain at least 35% chocolate liquor in North America and 43% in Britain. 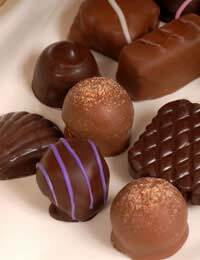 The best chocolates can contain up to 70% chocolate liquor. The higher the content of chocolate liquor, the more rich and flavoursome the chocolate. Bittersweet chocolate generally has a stronger chocolate flavour than milk chocolate or sweet chocolate. Semi-sweet chocolate generally contains more sugar than bittersweet chocolate. Semi-sweet chocolate will keep for several years, if well wrapped and stored in a cool dry place with good air circulation. Unsweetened chocolate: also known as baking, plain or bitter chocolate. No sugar has been added to the chocolate so it has a strong, bitter taste and is rarely eaten on its own. Bittersweet chocolate: dark, but slightly sweeter than unsweetened chocolate. It has had sugar, cocoa butter, lecithin, and vanilla added to it. It has less sugar and more chocolate liquor than semisweet chocolate but the two are generally interchangeable in baking. Bittersweet chocolate contains a high percentage (up to 75%) of cocoa solids, and very little (or no) added sugar. Semisweet chocolate: this chocolate has been slightly sweetened during processing, and is most often used in frostings, sauces, fillings and mousses. It contains a high percentage (up to 75%) of cocoa solids, and very little added sugar. German chocolate: this chocolate is dark, but sweeter than semisweet chocolate. Interestingly, German chocolate has no connection to Germany; it was developed by a man who was called German. Milk chocolate or sweet chocolate: this is the chocolate we know and love as a sweet confectionary. This chocolate has had whole and/or skimmed milk powder has been added. Milk chocolate is rarely used in cooking because the protein in the added milk solids interferes with the texture of the baked products. It contains approximately 20% cocoa solids.White chocolate: this chocolate is made with cocoa butter but no cocoa solids. Milk solids, sugar and vanilla are also added. Semi-sweet chocolate describes chocolate, which has a semi-sweet level of sweetness that falls between sweet milk chocolate and bitter chocolate liquor (cocoa solids). Most people know semi-sweet chocolate as dark chocolate and use it primarily in cooking, as it is too bitter to eat on its own.